Infantry and Artillery - Infantry and artillery units carry the national flag, 90 x 145 cm, with the coat of arms on the center and, inscribed on the upper blue stripe the words DIOS UNION LIBERTAD [God, Union, Liberty] and on the lower the type and number of the unit, all in gold. The staff is 250 cm long and 4 cm in diameter, with a gold-colored rhomboid lance-head, edged on the sides and at the point. [Below the lance-head, two blue and white streamers are attached, but I'm not sure of the specific design.]. There is only one artillery regiment in the SV army. Cavalry - Cavalry units carry the same flag, but with the inscriptions in silver. The image: Regiment of Artillery, El Salvador Army. Here is a photo of military flag. 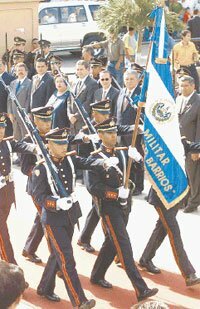 The flag of El Salvador Air Force is white with the force's badge. According to Album 2000 [pay00]: Aircraft Marking - Blue-white-blue roundel. The Album 1990 Recapitulative edition of 1995 shows Aircraft Marking - National triband on the fin. Fuerza Aérea Salvadorena was formed in 20 March 1923 as Flotilla Aérea Salvadorena. From the start, it used a blue-white-blue roundel. The only change was in the tail colors which were changed from vertical rudder stripes (www.skytamer.com/el-salvador/01.htm) to horizontal rudder stripes in 1930 (www.skytamer.com/el-salvador/02.htm) and to fin flash in 1965 (www.skytamer.com/el-salvador/03.htm). See also images at www.acig.org/fas_p-51d_402.jpg and www.acig.org/fas_f-4u_220.jpg. You can read an articles and see photos about the FAS at www.laahs.com and www.scramble.nl.